Mary Meehan Firtl received her BFA in painting from the Herron School of Art with a minor in printmaking. She is a charter member of the Northern Indiana Pastel Society. As a former courtroom sketch artist she still continues the habit of working quickly, capturing the essence of scenery experienced on her travels, or focusing on more detailed work such as a still life or animal that sparked the need to paint in pastel. Mary works as a Senior Graphic Designer at Saint Mary’s College in Notre Dame, IN. 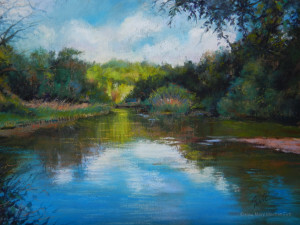 Her paintings are available through CircaArts Gallery in South Bend, IN, or the Dot Shop at the South Bend Museum of Art.